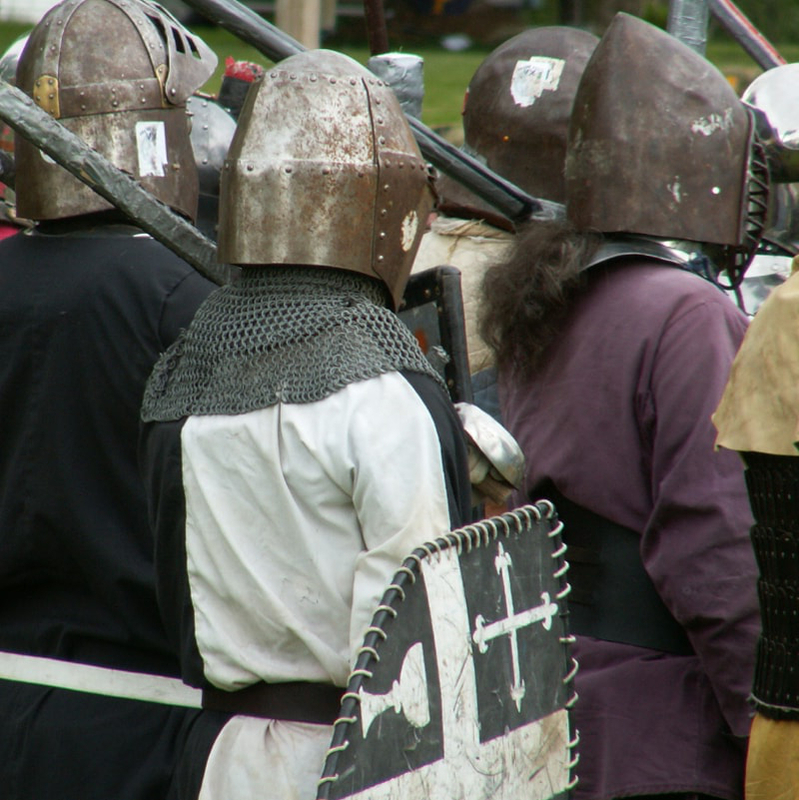 The Society for Creative Anachronism (SCA) is an international organization dedicated to the research and re-creation of pre-17th century Europe. Members do research into ancient crafts and activities of the Renaissance and earlier and then attempt to re-create them. As such members study fiber arts, calligraphy, metal working, music, brewing, cooking, combat, and much, much more. Part of this research and re-creation of old arts is the active use of these arts and crafts. A metal worker in the SCA does not just make armor, but makes armor to be used in combat in the SCA. Someone researching cooking does not just research the dishes of pre-17th century Europe, but seeks to prepare the dishes for feast at an event. The SCA is very much a hands on organization and as such active participation is encouraged. If you are unsure what you want to do now, talk to SCA members, attend events, and see if something catches your interest. There is a little of everything in the SCA, and plenty that one can do. At the base of the SCA is the local group. A local group can be a Shire which has 5 sustaining members, or a Barony which has 25 sustaining members. There are also Cantons which are a local group with 5 sustaining members and form part of a Barony. Shires, Cantons, and Baronies make up Kingdoms. Each Kingdom is ruled by a King and Queen who gain the throne by winning a Crown Tournament held twice a year (a king and queen's reign is for six months). There are also Prince and Princesses who are winners of a Crown Tournament waiting to ascend the throne, or as rulers of a Principality. Many kingdoms have Principalities within their borders. Principalities are much like Kingdoms, but answer to the Crown of a Kingdom, and as such form a part of a Kingdom. Every group is run by a group of officers who each must be a sustaining member. In addition to Shires, Cantons, and Baronies there are also Households and Guilds. Households and Guilds are unofficial groups. A Household may be the followers of a Knight or other personage, or simply a group of friends. Guilds are formed around a special interest such as cooking, and have their own rules and customs. What Should a Newcomer Expect? If you are new to the SCA and attend a meeting of the Shire of Amlethsmor you will be asked to introduce yourself. The other members of the Shire will then introduce themselves. If it is a business meeting the business at hand will then be conducted. Do not worry, you are not being ignored. Following the taking care of business a member or several members will take you aside and try to learn more about you and your interests while letting you know a bit about themselves. Do not be surprised if you are offered help in gettings started out. It is not unusual for Shire members to offer to help new members get garb (garb is what we call the medieval clothes we wear), or to refer you to people with similar interests. If you attend an informal gathering of the Shire this process is much faster. The members will introduce themselves, and set about learning your interests. Do not be shy. We love meeting new people, helping them, and bringing them into the Shire. If you ever have any questions use the Officers Directory on this website to find who to ask. If an officer does not have the answers to your questions he or she will refer you to someone that probably does. Remember there are no stupid questions. You do not have to be a paying member to take part in the SCA. Feel free to join our unofficial Facebook Group or Yahoo Group. Copyright © 2016 Kingdom of Calontir, Shire of Amlethsmor. The original contributors retain the copyright to certain portions of this site.